Unfortunately, this is a common misconception and Uncle Sam saw you coming. Starting no later than April 1st in the year after you turn age 70½, owners of Traditional IRA’s and other retirement plans must start withdrawing money from their IRA or 401k. 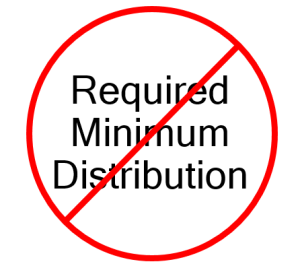 These are called Required Minimum Distributions (“RMD’s”) and you must start taking the “RMD” whether you need the income to live on or you don’t. The only exception: if you are still working at age 70½ you must take an RMD from your IRA plan, but you don’t have to start taking RMD’s from your 401k, 403b, or 457 retirement plan(s). Hold it! Why does your RMD rise until about age 89 and then decrease big-time thereafter? This is because the average lifespan of a male and female is age 89 and Uncle wants his money before you die. This is the ugly truth you didn’t know about. Withdraw money you didn’t need to begin with, live longer due to medical advances, and run out of money in your later years when you need it the most for medical care or the rising cost of living. * Note: the “Minimum Additional Tax Paid” is the minimum increase in tax. Since your RMD will increase each year (to a high of $6,585 in the 20th year), the actual amount of tax you will pay over time is much higher. Do you remember the quicksand we talked about? Not only are you being taxed on your $4,562 RMD, but you probably noticed that your taxable Social Security income increased from $25,125 to $29,003. 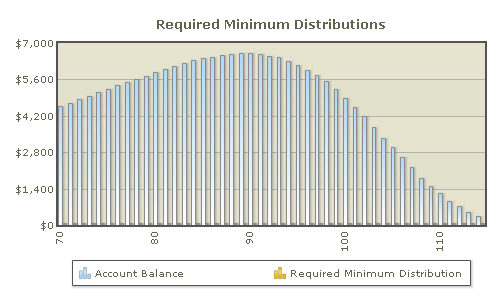 This means an additional $3,878 of taxable income on your tax return. (3) the actual tax cost (just first-year) was $1,290 versus $4,562 of in-your-pocket income from the RMD distribution. Divide $1,290 by $4,562: that’s a 28.28% tax rate. Wow. Where’s that promise of a lower tax now? You want the truth?! You can delay, for up to 15 years, taking an RMD on up to $125,000 of your IRA, 401k, 457, or 403b savings. The irony? It’s IRS-approved. No, I’m not kidding.